Glittering stars shoot past the sky’s limit on a small blue and gold pin. These stars, made of small diamonds, are set against a backdrop of deep Wellesley Blue. They represent the Fellows of the Madeleine Korbel Albright Institute for Global Affairs. 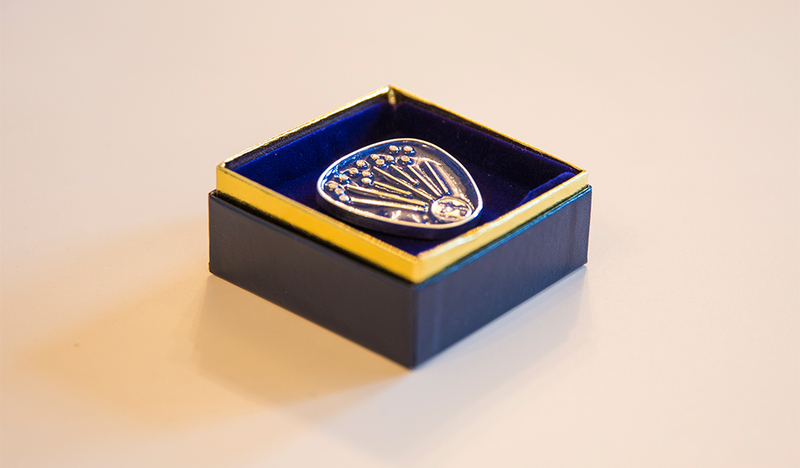 S. Joanne Murray '81, Founding Director of the Albright Institute, commissioned the creation of the pin from local silver and goldsmith John C. Harwood. Identical pins were presented to Former U.S. Secretary of State Madeleine Albright '59 and to Wellesley President H. Kim Bottomly at a dinner in late January celebrating the first reunion of Albright fellows. "From the time we had amassed enough fellows to hold a reunion, we knew we wanted to symbolize their work in the world through Secretary Albright’s signature pin collection," Murray said. "It was especially lovely to be able to thank President Bottomly as well as she closes out her years at Wellesley, since it was under her leadership that the Albright Institute grew and prospered." This is the second time Harwood has been tapped to design a pin for Albright, he worked with Gary Stucchi in 2010 to make a pin celebrating the Institute’s first class of fellows. The MetroWest Daily News recently spoke with him about his work. This second pin, he told the newspaper, "is more focused on what the Institute has done sending the students out [into the world] and what they have accomplished." Murray said the pin fits perfectly with the Institute’s goal "for there to be women around the globe working to create a more stable, peaceful world." Albright is well known for her love of pins, a selection of which visited the Davis Museum in 2014. Her collection has grown organically over time with pins purchased as chance finds or presented as gifts from family, friends, colleagues, and world leaders. She has been known to use pins to express a message, perhaps most notably a serpent pin that sent a message to Sadam Hussein. "This all started when I was ambassador at the U.N. and Saddam Hussein called me a serpent," Albright told NPR in 2009. "I had this wonderful antique snake pin. So when we were dealing with Iraq, I wore the snake pin." The new pin was presented at a celebratory dinner the evening before last month's public dialogue. That event enjoyed national and international press coverage: Albright spoke to WBUR’s Radio Boston, and days before the weekend events she penned an op-ed for the Boston Globe; the talk was also covered in the Guardian, SF Chronicle, Houston Chronicle, and mentioned on NPR's Marketplace. The Albright Institute at Wellesley brings a unique interdisciplinary methodology to addressing the challenges we face in the world today. Each year, 40 Wellesley students are chosen as Albright Fellows and begin a transformative process that takes them from a Wellesley classroom where they learn from a series of distinguished faculty during the Wintersession program, to internship placements at leading organizations around the world, and back to campus to reflect on and share their experiences during the Tanner Conference. -Helena McGonagle '16 contributed to this story.